Sweaty palm is a common problem that annoys computer professionals while gripping mouse during extending work sessions. Addressing the issue, designer Michael S Hoefler has come up with an ergonomic mouse that allows better grip, no matter how long will it take to complete your work on your system. Dubbed “Ergo,” the latest mouse comes integrated with unique texture and shape to ensure good circulation and keep your palm sweat free. 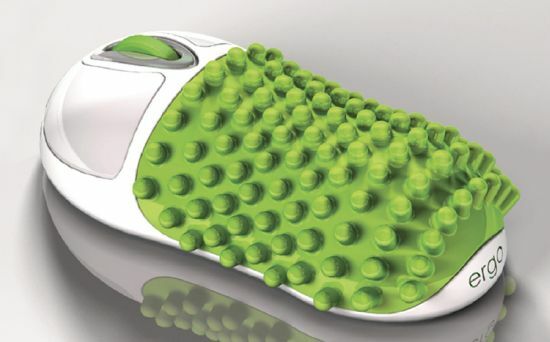 Featuring the body finished in plastisol, a suspension of PVC particles in a plasticizer, the Ergo Mouse comes built-in with dimples to let the air flow between palm and the mouse, which not only allows better grip but also stimulate hand muscles through massage and keep the hand cool and dry.